Home » Boxing » What’s next for Jaime Munguia? Jaime Munguia’s handlers are going to want to be careful going forward. For the last year or so, Jaime Munguia has been thought to have star potential, which has been pushed heavily by promoters and TV people. It’s obvious why they believe this: he’s young, fun to watch fight, and Mexican, which brings with it arguably boxing’s most dedicated built-in fan base. But there are questions, too. Munguia, 22, is a big kid for 154 pounds, and the inevitability of him having to move up to 160 has been there since anyone knew who he was. Going into last night’s mandatory WBO title defense against Dennis Hogan, that was the main focus of the pre-fight talk. Oscar De La Hoya had said recently during another DAZN card that this would probably be Munguia’s last fight at 154. This was expected to be a triumphant goodbye to the junior middleweight division for Munguia. On that same note, it was also expected that Munguia would physically overwhelm Hogan, a lightly-regarded fighter coming to Mexico from Australia, originally from Ireland. On paper, Hogan was your typical nonsense mandatory challenger. In his biggest fight, back in Dec. 2015, he lost to Jack Culcay in Germany. And though he’d won six straight, none of those six wins came over an opponent that anyone would consider a genuine contender. Hogan said all the right stuff leading up to the fight. He said losing to Culcay was actually the best thing that ever happened to him, because it changed his approach to boxing. He took the sport more seriously now, worked harder, changed his team, and had improved. But pretty much every 20-to-1-type underdog says those things before this kind of fight, and then they get smashed as expected. Hogan did not get smashed. He fought the fight of his life, and gave Munguia fits. 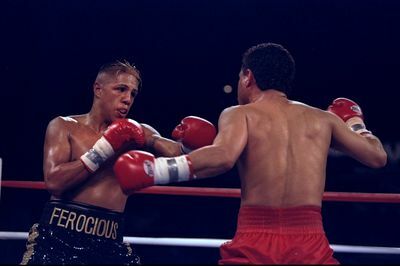 At times, Munguia looked lost in the ring, with Hogan making him swing and miss, catching him with clean shots, and not buckling when Munguia did connect. I had Hogan up early, but I did think Munguia forced his way into a narrow lead after seven rounds, the tide appearing to have turned, with Munguia bulling his way toward victory. But Hogan didn’t go away. He won a round. He won another. He won another. He won another. In the 12th and final round, Munguia, knowing full well the fight was at the very least up for grabs, blitzed hard and gave it his all, to his credit. But Hogan stood up to the pressure and made the final bell. I scored the fight 115-113 Hogan, and I know that’s a close score, and it means that one round the other way and it’s even, two rounds the other way and it’s a Munguia win. But I didn’t think this was a particularly hard fight to score; in the couple of toss-up rounds, I shaded to Munguia. I believed I had it about as close as it could have really been. But it’s boxing. And it was Mexico. And Munguia is the guy with the power promoters, not Hogan. Munguia is the guy worth money who has been guided toward stardom, not Hogan. So I knew before we even heard the scores. I knew there was no way that Dennis Hogan was going back to Australia with the WBO title and the clubhouse lead for Upset of the Year. At best, I expected he’d get a draw. 114-114, 115-113, 116-112. A majority decision for Jaime Munguia. 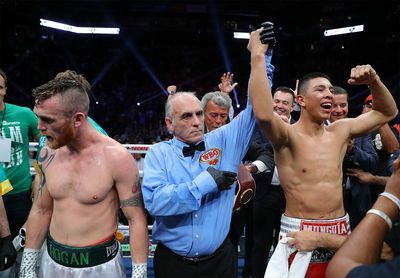 A wide smile broke out over Munguia’s face as Florida referee Frank Gentile pointed to him as the winner. To Gentile’s right, Hogan’s shoulders slumped and he turned away in disbelief. “I know I won the fight. I know it in my heart and soul,” Hogan said just minutes later. Hogan (28-2-1, 7 KO) claims that he was offered a rematch in the corner by a promoter. He also says he’d take one. Don’t expect it to happen. The best that the 34-year-old Hogan can hope for now, in all probability, is for Munguia to move up to middleweight, vacating the WBO 154-pound title, and that the sanctioning body will put him into a vacant title fight against somebody. Coming into this fight, the WBO’s top five contenders at junior middleweight were Hogan, Julian Williams, Kell Brook, Patrick Teixeira, and Bakhram Murtazaliev. Williams has a WBA/IBF shot coming on May 11 against Jarrett Hurd, but Brook and Teixeira would surely both be available and willing, and a fight with Brook for the vacant title could easily headline a show in the United Kingdom. But it’s no guarantee that the WBO or anyone else will reward Hogan for deserving to win on Saturday. The way boxing works, it could be the exact opposite, with everyone wanting to avoid this guy now. Hopefully, he’ll get another shot. He earned it. So what about Munguia? What about the young would-be star? A couple days ago, Chris Mannix had an article at Sports Illustrated discussing the potential for Munguia to be a star, and also the potential for him to be a flameout. Mannix, who also worked the fight for DAZN last night, said on the broadcast one of the things he says in the article: it’s hard to tell exactly what we have in Jaime Munguia. Gomez says he has seen enough out of Munguia to believe that he would beat Golovkin, if given the chance. Anyone who watched Munguia-Hogan last night knows that the same flaws we saw last year against Liam Smith are still there. He gets hit a lot. His defense is porous. In short, Golovkin, even at 37, would absolutely eat him alive. And unlike Hogan or Smith, Golovkin has serious power. One of the names brought up by the DAZN team last night in comparison to Munguia was Fernando Vargas. “El Feroz” ran up a 19-0 record by age 22, the same age Munguia (33-0, 26 KO) is now. Munguia has fought more because he fought a lot in Mexico coming up, turning pro at 16, but Vargas had faced tougher opposition, including stoppage wins over Yori Boy Campas and Raul Marquez, and decisions over Ike Quartey and Winky Wright. The fight with Wright was a highly disputed majority decision. Just days before his 23rd birthday, Vargas faced Felix “Tito” Trinidad. Trinidad stopped him in the 12th round. He took a couple of rebound fights and won them both, then faced Oscar De La Hoya in a highly-promoted, highly-anticipated grudge fight. The fight lived up to its billing, and De La Hoya stopped Vargas in the 11th round. Vargas’ career never really recovered. He was 24 years old when he lost the battle with De La Hoya. He went 4-0 between 2003 and 2005, then lost two fights to Shane Mosley, both stoppages, in 2006. He took a heavy catchweight fight with fellow trash talker Ricardo Mayorga in 2007, and lost a majority decision. He never fought again. His last fight came before his 30th birthday. He could have fought on, mind you — Vargas, for various reasons, made the decision to step away and has stuck to it — but he was unlikely to add anything to his legacy by staying in the ring. His best years had come and gone. He was still young, but he was already at the “hanging around” part of his career. The idea from the DAZN commentary squad in bringing up Vargas was not to compare them head-to-head, but to frame Vargas as something of a cautionary tale about rushing young fighters into big fights. Vargas burned hard and bright in the sport, and while we remember him, that’s not anyone’s goal in boxing. But to avoid that sort of career for Munguia, his handlers are going to have to be careful. He said he has trouble making 154 pounds, so it’s probably time to move up to 160. Let’s say he does that. DAZN has the power brokers at middleweight in Canelo Alvarez and Golovkin, and also Daniel Jacobs and Demetrius Andrade. Unless Golden Boy is ready to cash him in and potentially cash him out, Munguia should go nowhere near any of those guys at the moment. They’d all light him up, and there may be no coming back from that. So who do you put Munguia in with if you want to play it safe but not be blatantly ridiculous about it? There are plenty of options in that regard, and it could very well be some total no-hoper, but let’s stick to names people have heard at least once or twice. We’ll go with five names. Tureano Johnson (20-2-1, 14 KO) is a veteran fighter, age 35, and has been stopped in both of his losses, to Curtis Stevens in 2014 and Sergiy Derevyachenko in 2017. He was supposed to face David Lemieux this past December on the Canelo-Rocky card, but when Lemieux had to pull out late, his return from an already-lengthy absence was delayed further. Johnson fought on Feb. 9 in California, going to a very disappointing eight-round draw with journeyman Fernando Castaneda. Walter Kautondokwa (17-1, 16 KO) has worked with the DAZN team before, coming in last October to face Demetrius Andrade for the vacant WBO middleweight title. Andrade totally dominated the fight. But that means the 34-year-old Namibian is now “former world title challenger Walter Kautondokwa,” which is a thing promoters can put in a press release to make a fight sound better. Currently, he’s scheduled to return to action in Windhoek, this coming Saturday. Artur Akavov (19-3, 8 KO) is not just “former world title challenger Artur Akavov,” he’s “former two-time world title challenger Artur Akavov,” which is twice as good. The 33-year-old Russian, based in California, lost a competitive decision to Billy Joe Saunders back in 2016, and was stopped by Andrade in his last outing on Jan. 18 in New York. 28-year-old Luis Arias (18-1-1, 9 KO) stunk out the joint but went 12 with Daniel Jacobs in Nov. 2017, then returned a year later to go to a 12-round draw with Gabriel Rosado. He can be an awkward sort of fighter, to put it nicely, but his W-L record looks good. And what about Gabriel Rosado himself? Rosado (24-12-1, 14 KO) is a total battler and would no doubt make for a very entertaining fight with Munguia. The 33-year-old Philly scrapper returned on March 15, losing a dramatic fight against Maciej Sulecki. Rosado was down twice, but dropped Sulecki and hurt him badly in the ninth round, and Sulecki barely survived the rest of the fight to escape with the decision win. Of this group, Rosado is perhaps both the most appealing and the least likely to get the call next. He’s a guy that just never gives up in a fight, never goes away, and Munguia showed some gas tank issues against Hogan. These are not the ideal names that boxing fans will want to hear about, but they are, I think, realistic options for what might actually be next up for Munguia. As for Chris Mannix’s question of whether or not we know what we have in Munguia, frankly, I think we have a pretty good idea. He’s young, true, and with that you hope he can improve, but ultimately I think he’s one of those guys who just is what he is: an entertaining, highly-flawed fighter who will get chewed up against true top fighters. There’s plenty of value in that career, for the fighter and fans and promoters alike. But true superstardom is not in Munguia’s future, at least as I see it.